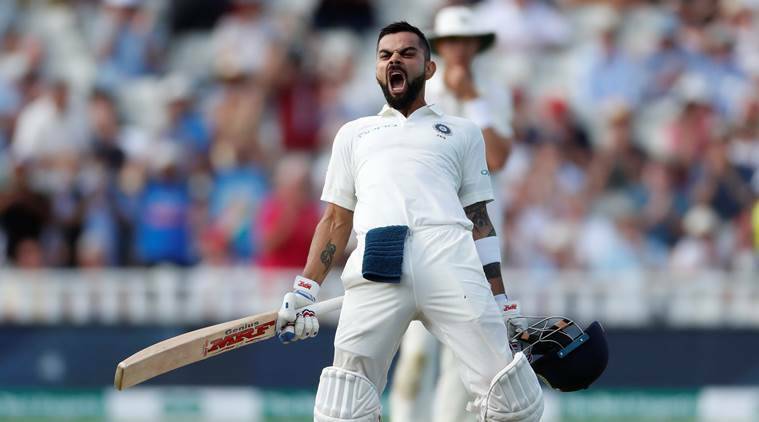 India captain Virat Kohli smashed his first hundred on English soil in Test cricket on Thursday. Laying the horrors of the 2014 series to rest, Kohli batted with grit and patience to bring up his 100 in 172 balls during the second day of the first Test at Edgbaston. After reaching the three-figures Kohli celebrated with gusto by raising his bat and then kissing his ring. Kohli reached the three-figure mark with a slice over the point region in the 65th over of India’s innings. However, the Indian skipper also survived two dropped chances. But in the context of this series his innings is invaluable. Kohli’s fantastic innings was also laced with 16 beautiful boundaries. For one of the best stroke players in the world, this Virat 100 was about ânotâ playing strokes. He left 40 balls alone. 26 against Anderson. Thatâs more than 4 overs of Anderson left alone. Meanwhile, in the list of most hundreds as a Test captain Kohli is now third on the list with 15. Graeme Smith leads the tally with 25, Ricky Ponting is next with 19.